Preheat the oven to 325 degrees F. Line a 9X13-inch baking pan with aluminum foil, lightly grease the foil with cooking spray, and set aside. In a medium bowl with a handheld electric mixer (or in the bowl of a stand mixer fitted with the paddle attachment), whip the softened cream cheese until smooth. Add the sour cream, sugar, and flour. Mix on medium speed until well-combined, scraping down the sides of the bowl as needed. Set aside. For the brownie batter, combine the chocolate and butter in a large microwave-safe bowl. Microwave for 1-minute intervals at 50% power, stirring in between, until the chocolate and butter are melted and the mixture is smooth (don't overheat). Stir in the sugar, eggs and vanilla, and whisk until well-combined. Add the flour, baking powder, and salt. Mix until combined, just until no dry streaks remain. Spread 1/2 of the batter evenly into the prepared pan; it will be a thin layer. Dollop the cream cheese batter in large spoonfuls over the brownie batter. Spread into a somewhat even layer (doesn't have to be perfect). Microwave the reserved batter for 10-15 seconds. Give it a good stir and drizzle or dollop it over the cream cheese layer. 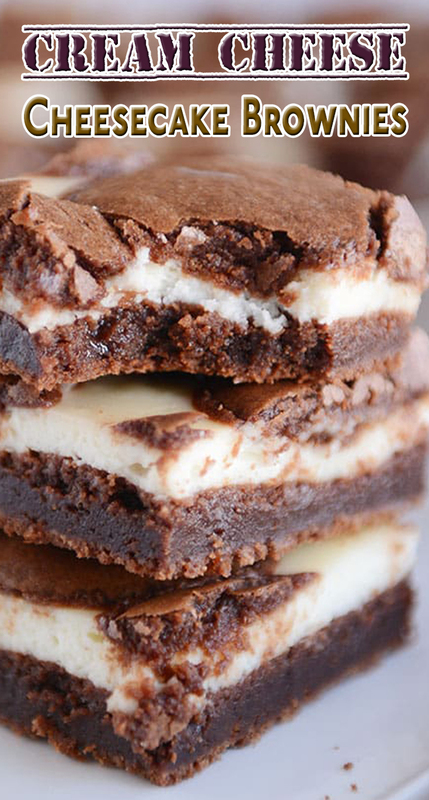 If desired, use a knife to swirl the brownie batter through the cream cheese filling, leaving a thin border around the edges (I don't always swirl; sometimes I just leave it in dollops, but swirling will give a more even cheesecake to brownie texture). Bake the brownies for 35-40 minutes until a toothpick inserted in the center comes out with a few moist crumbs. Let cool completely in the pan and then refrigerate until chilled, 2-3 hours, for easier cutting. Gently lift the brownies out of the pan with the foil overhang, cut into squares and serve (or refrigerate cut brownies until ready to serve).